Is what I was thinking the first time Pao and I talked during our breaktime in the office. We were on the same technical writing training, I was in my late 20s, he was in his early’s. I did mention in our little introduction during class that I have a thing for slasher films, true crimes, and unsolved mysteries and so he probably thought it’d be a good ice breaker for talking with me. I know that I am weird, but I guess I was one of those who are weird and awkward and Pao was one of those weird and comfortable. Comfortable in a sense that he doesn’t give a fig about what other people think about his weirdness. It didn’t take long for me to warm up to Pao because that’s how weird people are, they connect. I remembered him when I went to Quezon City recently and asked him to meet me. 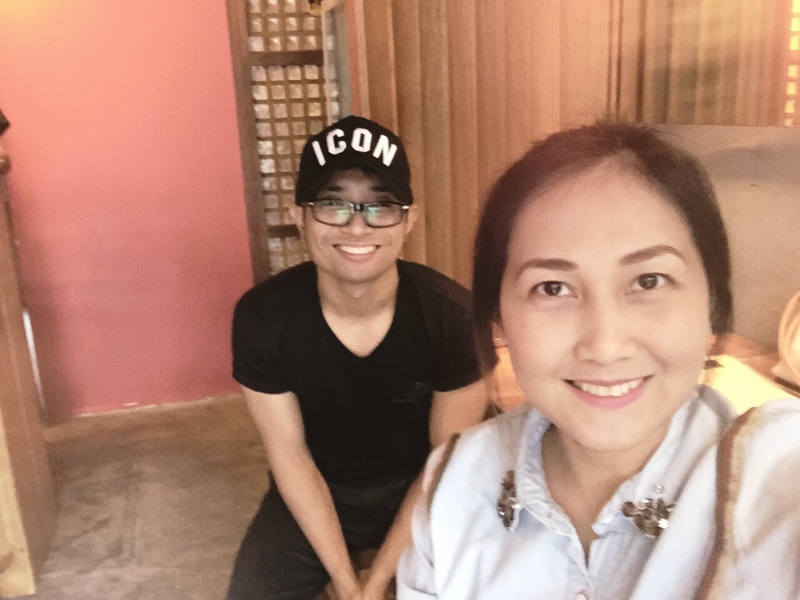 We met at a Filipino-themed cafe, KKK Coffee in Maginhawa. Due to another engagement I was late. Pao was already halfway through his chocolate cake, which I didn’t bother tasting. He was sipping coffee on a mug made of glass. Pao is no longer bald and chubby; in the recent years he has been into street workout, which dramatically changed his physique. He now has hair too, other than that, he remained as the same geeky guy that I know. Pao was years younger than me but with the brain of an old man. 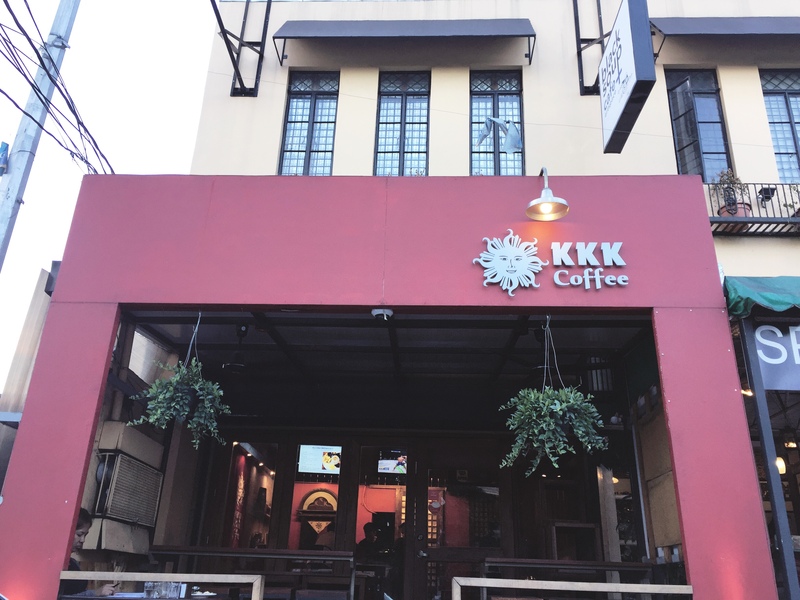 I googled for a list of cafes in Maginhawa and found KKK Coffee. I didn’t know what to expect, but the Filipino theme going on was enough to pique my interest. Do calm your t*ts nobody’s gonna get discriminated here. KKK is in reference to the Filipino revolutionaries, Kataas-taasan Kagalang-galangang Katipunan not the white supremacy. The space is small, no cushioned chairs so this is definitely not a place for lounging. I did like the simple design that they made of the place probably in consideration of the fact that it’s just a small space. 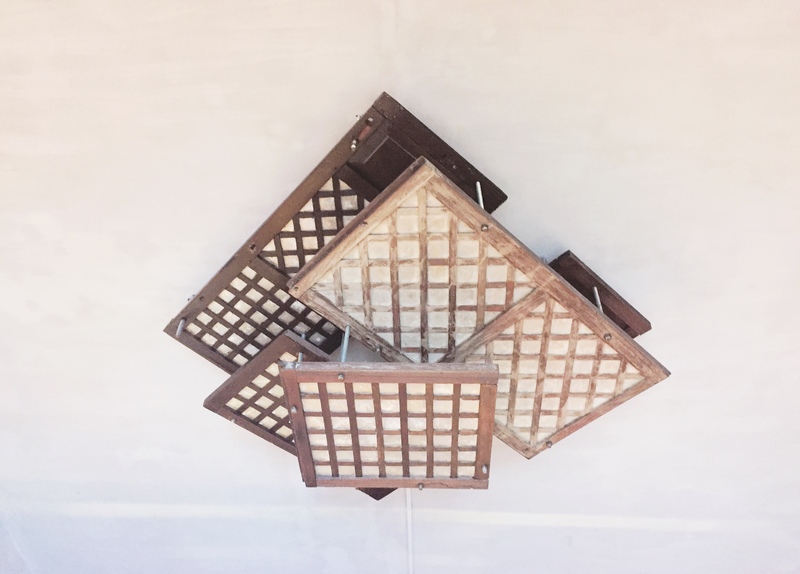 There is a KKK flag up on the wall, an old lantern, and a decor on the ceiling made of capiz windows. You know by how they designed the interiors that there is a theme but they didn’t go over the top so I really liked it. I decided to be a little adventurous and ordered a Kapeng Labuyo original (Medium PHP 109 – USD 2.16). I’ve never had a spicy drink before so I wanted to give it a try. 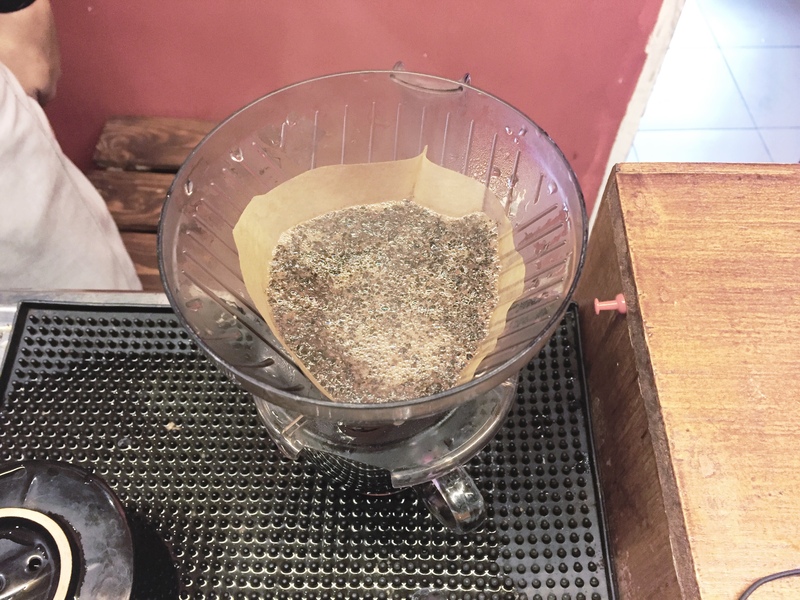 According to the barista they blend chili paste to brewed coffee to achieve that spicy and mild tangy taste. The first time I sip I have seriously forgotten that it’s supposed to be spicy so the zing caught me off guard. It’s the kind of sting that goes all the way to the back of the throat. I am a fan of spicy food so I thought I would like it, but I didn’t. The zing got to the point when it becomes a nuisance that I wasn’t able to finish my glass. 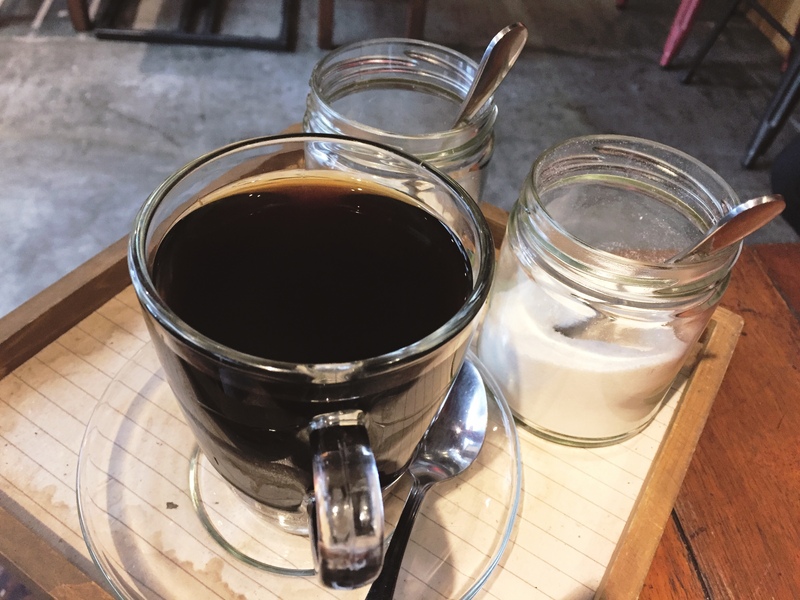 Pao had Kapeng Ginto, which is basically a creamy coffee. I did try it, nothing special with how it tastes but definitely better than the coffee that I had. I’d like to think I just didn’t order the right drink so I still want to give KKK Coffee another chance. I like the ambiance anyway so why not. I soon forgot about my coffee when Pao and I started talking. We spent a few hours catching up, discussing philosophies, politics, and other heavy shiznit I don’t usually discuss with majority of my friends. I’m not saying that my other friends couldn’t take it, but I know and accept that it is not their cup of tea so I lay off the heavy stuff when I’m with them. But not with Pao, this guy likes the dark stuff, which sorta betrays his happy disposition, and I love him for it. There was a little bit of reminiscing—we used to work in the same company after all—wondering how our other friends are doing, and getting serious discussing about how f*cked up the Filipinos are for following blindly their chosen idol (I do not mean showbiz). Pao claims he wants to be neutral, I told him people with his way of thinking is but a tiny spec in the population. People believe who and what they want to believe. We all live with biases and biases make people passionate. It makes the fools and the most intelligent of people lenient or tolerant of the evil their chosen figure makes and blind to the good deed of their perceived enemy. We’re all susceptible to it. Are we capable of being partial despite our initial belief? I say why not, we’re the thinking species after all. All I know is that we can all take a second look and give it another shot. Just like I am giving KKK Coffee another shot if I ever go back to Quezon City. Maybe next time I’d choose a better tasting coffee. Hahaha… Thanks, although I regret my choice. I’m sure you will like this cafe though. Hopefully someday we can meet over coffee!